I’ve been active on Twitter since 2008, yet Twitter had begun to lose its shine for me by the end of 2015. There was so much broadcasting, and so little conversation. In fact, it was getting downright boring. Then the political season erupted, and so did our new President’s use of Twitter. Since the election, and particularly the inauguration, Twitter’s come back from the dead to become one of the most exciting places to watch political expression unfold — and there’s a lot nonprofits can and should learn from recent history. Here are a five things I’ve noticed from following Twitter politics that your organization could use in 2017. When you need to share your side of the story, go directly to the people. Donald Trump did. While I personally did not support this candidate, I couldn’t help but notice the tactics. In this politicized climate, it is a given that organizations doing work on behalf of maligned populations, rallying people politically, or defending rights under attack will themselves feel the brunt of hatred. Have your Twitter profile polished off, ready, and active to speak directly with your stakeholders. Whoa. Look at those persona accounts go! When the Trump administration issued gag orders to several federal agencies prohibiting the use of social media, some folks created alternative government Twitter accounts. It’s been revealed that some of these alt accounts are decidedly NOT government employees, but some may yet still be. To be honest, this doesn’t even seem to be as important as their ability to create dialogue. When the government clamps down on allowing scientifically proven facts to be disseminated through social media, sharing this injustice on social media – where people converse about these issues – is an important mission. The 80+ “alternative” Twitter accounts are now followed by more over 1 million people, and they are sharing information about climate change, science, parks and yes, a bit of politics. I might add that persona accounts aren’t new. I’ve been a fan for 7+ years of Lily the Black Bear, The North American Bear Center’s Facebook page. What’s the right persona for your cause? Is now the time to think about creating one — for when you need to have a fresh voice to share what needs to be heard? Hashtags are the new (old) watercooler. Arab Spring gathered support around the many resistance uprising hashtags. #NoDAPL rallied supporters against the Dakota Pipeline. #blacklivesmatter emerged as a hashtag that now continues to focus conversations around this incredibly important topic. With the new administration’s executive orders, we must find the hashtags to meet and activate, or else create our own. As examples of generalized political hashtags, see #alternativefacts and #resist, or find very focused hashtags like #ACA #immigrantswelcome #muslimban and #refugeeban. Which hashtags speak to your cause? Who’s speaking the loudest? Find out who cares most, and begin conversation. Get around the virtual water cooler and stay relevant and informed. If there’s one thing we can clearly see from the past 10 days, it is the different voices of @realDonaldTrump, @POTUS and @WhiteHouse. Which one gets more retweets, media coverage, and followers? The one that tweets with the most personality wins. Every time. I can’t say it enough: people want to connect with people, not with logos. If you are an executive director or CEO, it’s time to get real. Blend who you are with the fact that you also have a very important job — and show your personality! You are the trusted news source. Since the beginning of the campaign season, the public has questioned the veracity of the candidates’ statements, and they questioned each other endlessly. Then the impact of fake news played out, as Americans began to understand just how much of the news headlines we read online might be false or misleading. 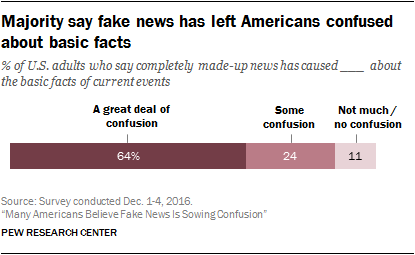 A December survey by the Pew Research Center revealed that at least 64% of Americans have been confused by fake news. This sense is shared widely across incomes, education levels, partisan affiliations and most other demographic characteristics. With the political news cycle every other hour, rather than every 24 hours, it is critical that you have a vetted list of trusted news sources on issues and causes. (Especially with the fact-playing of alternative facts.) Where do you turn to for trusted news? Even veteran journalist Dan Rather created a digital news company to do just that (news shared through Twitter and Facebook), playing on his trusted name brand. Welcome to News and Guts! It’s long been the name of @DanRather‘s company and we’re proud to say it’s now a digital news company as well. Mission-driven organizations and foundations: assure that you are a trusted news source for your issue(s). Figure out how to best assure folks of the veracity of your reporting and neutrality of your analysis, and the accuracy of your facts. Maybe it’s an editorial blog post, or its doing what you’ve always done — but stating clearly your position on sharing news and analysis. Reshare only content that meets your high standards of trustworthiness, and generously promote collegial organizations doing the same. Twitter is back! What have you learned from Twitter in 2017? Glad to hear Twitter is finally standing up again. I’m not a very huge fan of Twitter but I do agree Twitter is great for engaging with people because of it’s casual vibes. But in terms of branding, I’m not sure. What do you think? But don’t you think there is no future in these kind of topics since Twitter is working hard on tracking down fake news etc?